Watercolors are amazing, I think we can all agree. But you know what’s even better? Watercolors that shine. I can’t get enough of watercolor paints that gleam, glimmer, and flash in the light — whether it’s pearlescent or metallic paints. If I had my way, I’d slap some golden accents on every piece of paper I could reach. 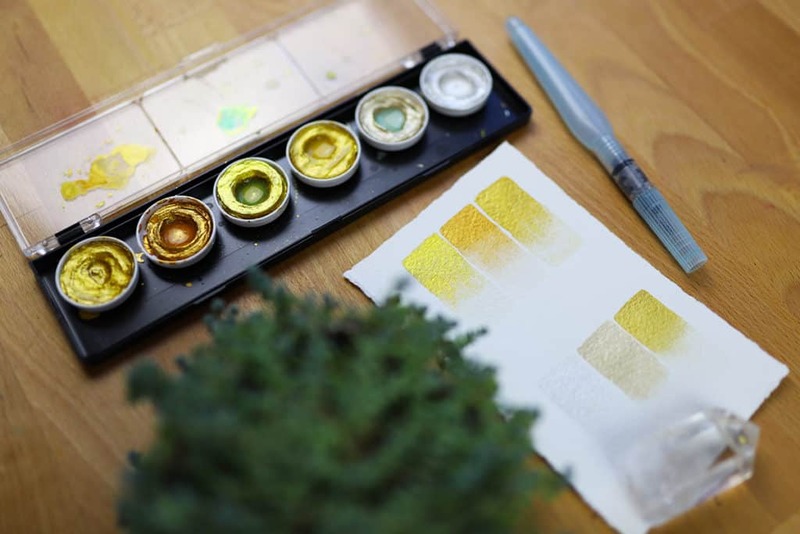 There are plenty of metallic and pearlescent watercolors on the market, but something about the Coliro brand of Finetec watercolors stands out. Let’s explore why that might be in this Finetec watercolor review. 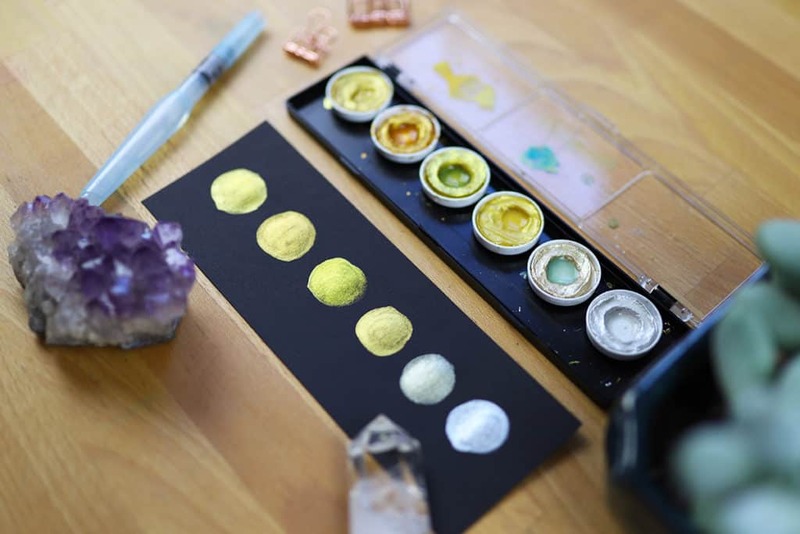 I first bought my gold Finetec watercolor palette with the intention of adding gold to my artistic paintings. It didn’t take me long, however, to start incorporating them into my bullet journal. Yeah, watercolors in a bullet journal. Crazy, huh? It’s actually surprisingly doable, and I went to town with my Finetecs. So if you’ve ever been curious about grabbing a set of these shimmering beauties, then keep reading for all you need to know before purchasing! You might wonder if you need anything special to use such special paints, but the answer is no! You can use whatever paintbrush you prefer and it will do the job nicely. 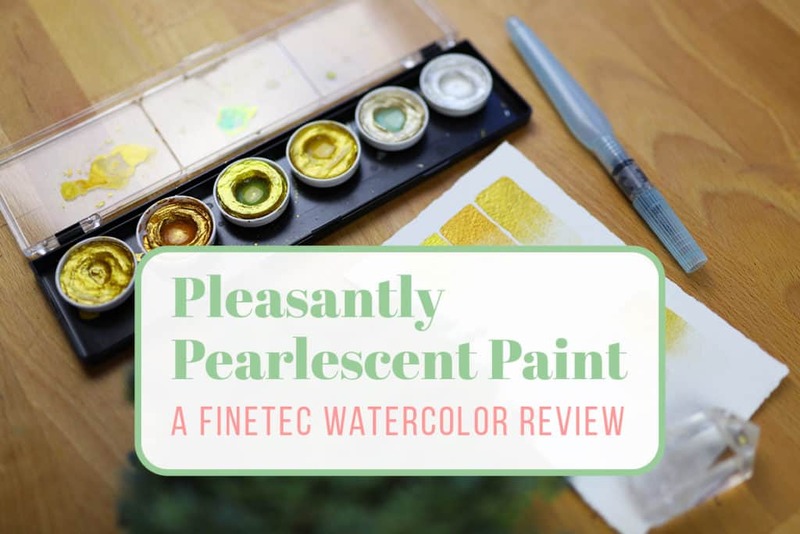 I tend to use Pentel Aquash Water Brush Pens while painting with my Finetecs, and you can see me using them in this review. 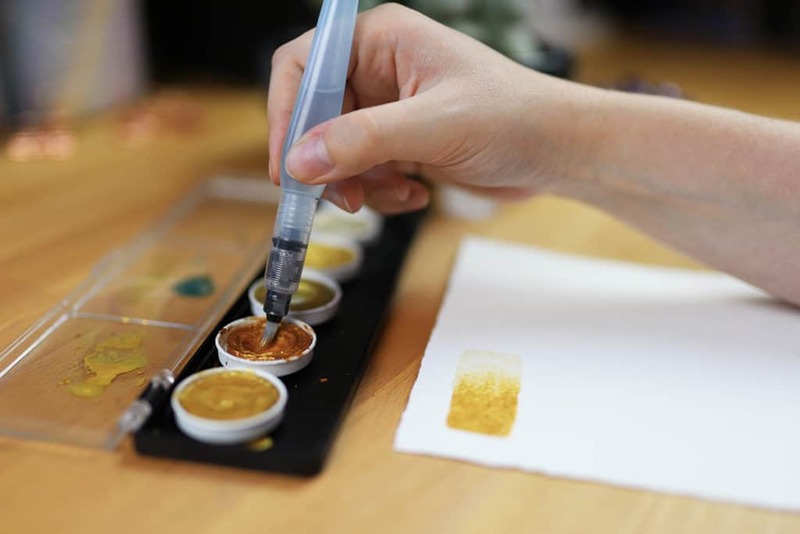 Head to this post if you want to see what other watercolor supplies I use and recommend! 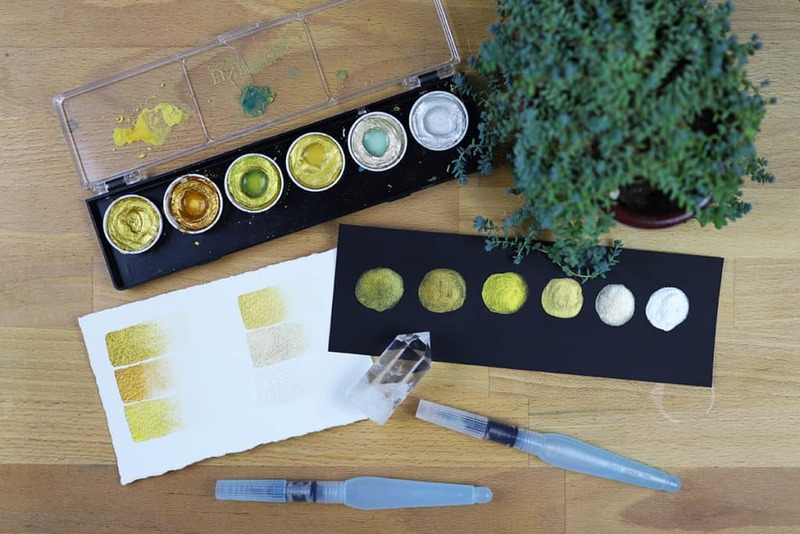 What sets Finetec watercolors apart from other metallic watercolor brands? I’m going to tell you why Finetec is, in fact, very fine indeed. A lot of other pearlescent watercolors can be a bit patchy, uneven, or transparent when applied to the page. Finetec watercolors, however, are extremely opaque and thick. You don’t need to pile on several layers of this rich paint in order to achieve a dense opacity. As I’m sure you could infer by the sheer number of palette options, Finetec has a ton of color options. There are literally dozens and dozens of individual colors sold by Coliro, Finetec’s mother brand. 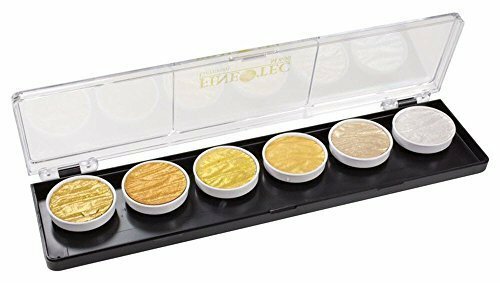 If you wanted to expand your Finetec collection, you can even buy individual wells of many colors on Amazon. When I first bought my Finetec watercolors, I was terrified that I would use them up quickly. However, despite aggressively using this gold palette for over two years, I haven’t run out of a single color yet. They seem to last forever! That’s a pretty good value if you ask me. If you think you can only use these for art, then you aren’t thinking big enough. I’ve used Finetec watercolors for both watercolor brush lettering and nib calligraphy with stunning results. These paints make an excellent addition to any letterer’s toolkit. When you purchase one of Coliro’s pre-made watercolor palettes, you have an option to customize your palette thanks to some clever design. Each watercolor well clicks into the body of the palette securely, which means that if you want to swap out colors from another palette, you can with ease. That way you have total control over which colors you keep together for your convenience. With nearly every glittery or shimmery product I buy, I always seem to find that glitter on my clothes, skin, furniture, dog… everywhere, basically. It’s not exactly ideal. You don’t need to worry about that with Finetec watercolors, though! 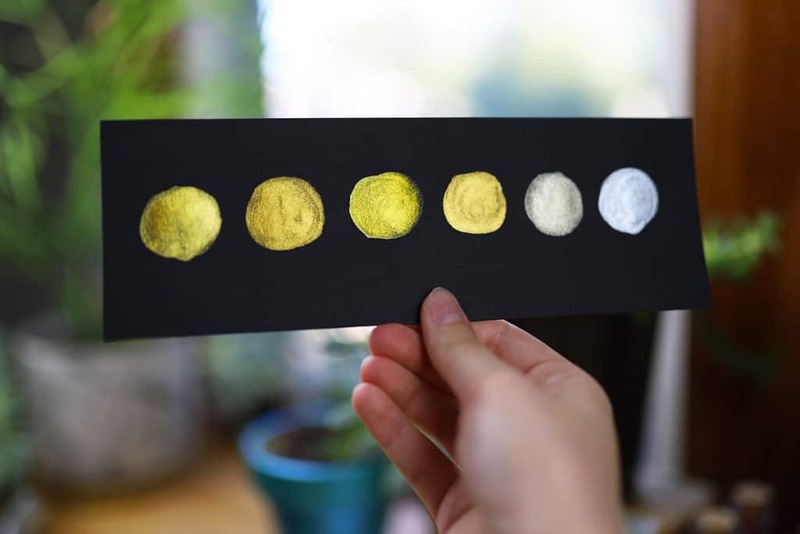 Once the paint is dry, you can swipe your finger across it, rub it on clothes, or close up your journal without getting pearlescent dust on everything you love. These spectacular watercolors might be gorgeous, but they aren’t perfect. 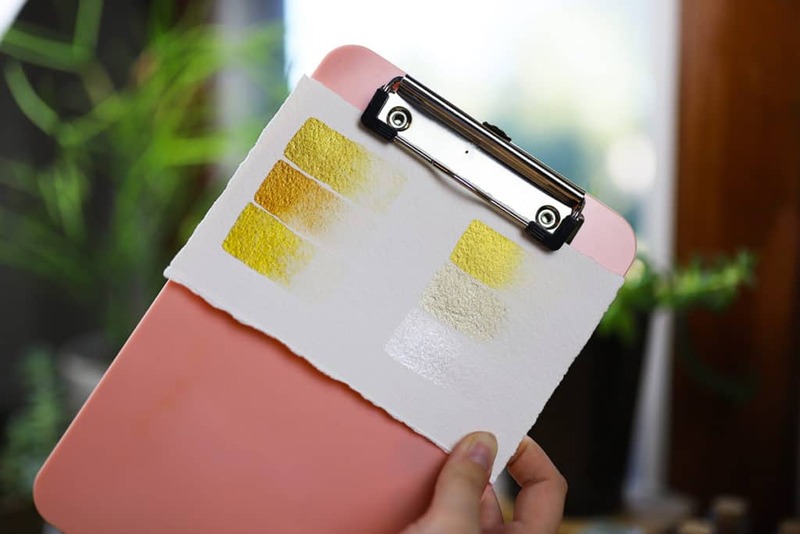 Here are some things to consider before you purchase yourself a set of these pearlescent paints. This is the biggest holdup that folks experience when they look at buying Finetec watercolors. These beautiful paints come with a pretty hefty pricetag to the average consumer, with most 6 paint palettes running between $25-$30. Unless you’re working in the creative field or totally comfortable dropping a chunk of change on art supplies, this can be more than a little intimidating. It certainly scared the pants off of me when I first bought mine. However, I will remind you that my heavily used palette has lasted for over two years, so keep that in mind while you make your decision. I’ve found that the cost has totally been beyond worth it, but at the end of the day, it’s your money and your call. You might enjoy mixing and creating new colors with your watercolors. After all, isn’t that half the fun of watercolors? Unfortunately, I’ve never been a huge fan of the results when I mix my Finetecs with other colors. The results aren’t terrible, but I’m not pulled to do it again and again. You can see an example of mixing a gold color with blue watercolor in this monthly Instagram post from May of 2017. When you use your Finetec watercolor on sturdy paper like watercolor paper or cardstock, then you don’t need to worry about this particular issue. If you try to use your watercolors on thinner paper, though, be warned that the pigments in the paint will settle in any lower points of the page. That means that any warping of the paper will result in little uphills and downhills on the paper, and the rich pigment will settle in the downhills. This tends to leave the uphills a bit translucent and not as opaque as one might want, and it’s all due to the metallic pigment being heavier than typical watercolors. To avoid this problem, make sure to use your Finetecs on watercolor paper! If you’re ready to take your brush lettering, nib calligraphy, or watercolor art to the next level, then Finetec watercolors are perfect for you. I love these paints so much and I’m sure you will be absolutely inspired by them. I’ve used them in projects far and wide, including my annual holiday cards that I send to my entire family — let me tell you, they thought the shiny lettering was delightful. Not only are they a joy to use, but they’re also a joy to share with others, and I’d highly recommend them for any creative looking to step up their game. I hope you have found this Finetec watercolor review helpful! Let me know in the comments section what product you want me to review next, and head to the My Supplies page to see some of my other favorite materials!